Art-C: Warli art.....a most vivid & engaging way of story telling!!!! Warli art.....a most vivid & engaging way of story telling!!!! The common match-stick figure drawings that most of us have come across in craft exhibitions can be traced directly to the Indigenous people of Maharashtra, India, a fact that took me by surprise, since I thought it was a craft brought to the country from outside!!!! Called as Warli art where the word 'Warli' means 'piece of land', these drawings are created by the varlis, a scheduled tribe who live in parts of Gujarat & Maharashtra. They are a very old tribe & have a lineage that can be dated back to the 10th century. They speak an unwritten language mingling various dialects & communicate mainly through their drawings which are simple yet unique, the only way of transmitting folklore to the general populace. These rudimentary drawings, use a very basic graphic geometric vocabulary but with a sense of depth & meaning derived from nature. The circle represents the sun & the moon & the triangle, mountains & trees. Only the square seems to be invented, denoting a sacred enclosure or a piece of land which is the central motif in every ritual painting. 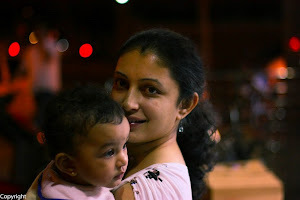 It is called the cauk or chaukat wherein we find the Palaghata or Mother Goddess. Male gods weren't given much importance in this. The common scenes in these paintings were those of hunting, festivals & farming. A unique feature of these paintings is that humans are represented by 2 triangles joined at the hip. The upper triangle being the trunk and the lower triangle the pelvis. Their precarious equilibrium symbolizes the balance of the universe, and of the couple, and has the practical and amusing advantage of animating the bodies. The paintings were most often done on the inside walls of huts which were made of branches, earth & cow-dung & were reddish ochre in colour. The figures painted in white, were made of a mixture of rice paste & water with the help of bamboo sticks. 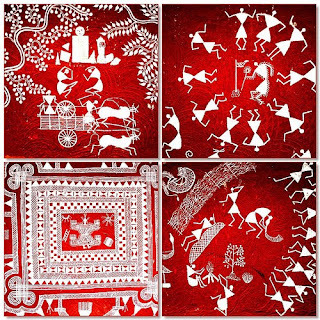 Done mostly during marriages & festivals, these crude styled paintings were given a radical change by the Warli artist, Jivya Soma Mashe who pursued it artistically & is primarily responsible for a renewed interest in this art form as we see it today!!! !